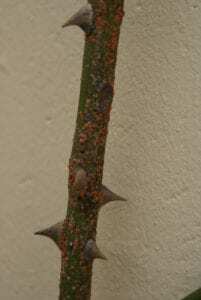 Pernicious scale is a sedentary sucking insect that inserts its tiny, straw-like mouthparts into the bark of rose stems, weakening growth and reducing sap flow. In extreme cases, whole stems can die-back but in small, isolated numbers they do not pose a real threat to the rose. Their presence is a sign of plant stress which in most cases is due to a lack of water, poor soil conditions or root competition. 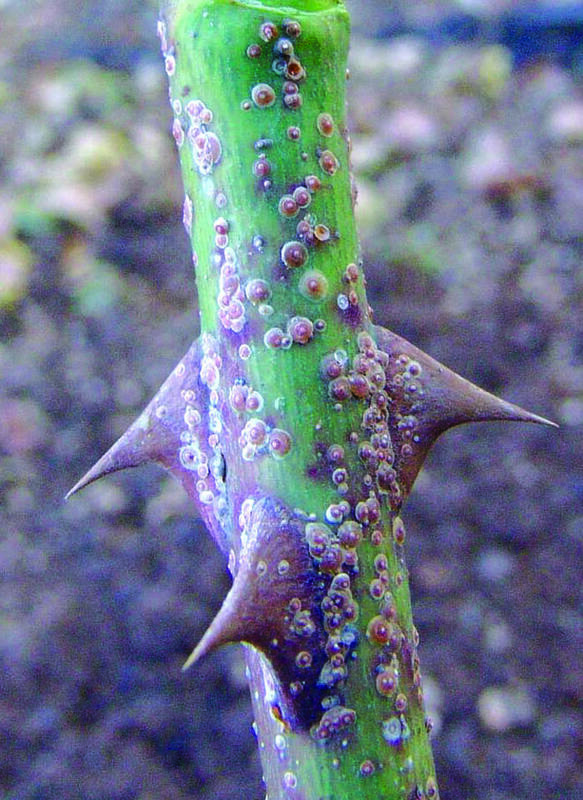 Improving growing conditions will significantly reduce the rose’s vulnerability to scale infestation particularly during hot dry weather. They are such oddly shaped and immobile insects that they often resemble shell-like bumps rather than a pest. Diaspidiotus perniciosus bugs are between 1.5 and 2 millimeters in diameter. Adult female scales have long, thin brownish/red, segmented and wingless bodies covered by a brown circular protective waxy shell. The waxy scale, made from body secretions and molted skins, adheres strongly to the stem and not to the insect itself – this method of self-protection makes the female immobile but virtually impenetrable to natural enemies and chemical sprays. Pinhead sized nymphs “crawlers”, resembling mites, usually travel a short distance up the stem after hatching and begin feeding – within a short period of time, the female “crawlers” begin producing a shell of their own. Adult male scales appear as tiny gnat-like insects with a pair of wings and long antennae and are white or yellow in colour. They have a very short lifecycle (about 2 days long) as such they are rarely seen on the plants. Both adult females and nymph feed on plant sap from rose canes and sometimes leaves. 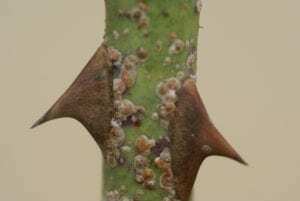 The insect injects saliva into the plant with its piercing-sucking mouthparts which breaks the plant cells down – the resultant sap is then ingested. Infestation initially starts at the base of the older stems and slowly moves upwards as nymphs hatch and migrate higher up the stem. 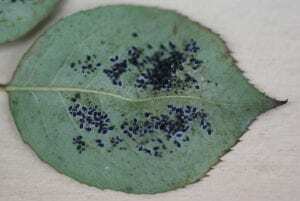 Severe infestations will cause significant sap loss and plant vigour. Lower leaves may drop or become brown prematurely causing partial defoliation. Vastly infected stems and twigs can die-back completely. Should growing conditions not be improved the entire plant can die. 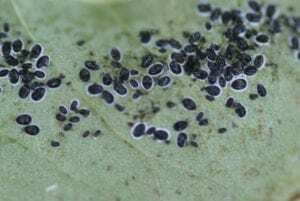 Scale insects are more prevalent during hot dry periods and plants that are under stress are more prone to their infestation. The stress is usually caused by lack of water, excessive root competition or poor drainage. Check that the plants are getting enough deep regular watering – between 5 -8 litres of water 3 times a week in Summer. If red spider infestations are often a problem, then a lack of water may likely be the main cause of the scale infestation as well. Are the roses closely planted to large shrubs or trees? Are there plants creating a hedge in front or behind the roses? Are there lots of visible roots in the soil? This is usually the tell-tale sign of unfavourable root competition. Trees and shrub have a tendency to grow a mat of roots above the rose’s roots enabling them to ‘steal’ food and water that was destined for the rose. Dig a drench between the roses and trees/shrubs in an effort to sever the encroaching roots. This needs to be repeated every 6 months at least. (Planting roses in large 40 litre plastic planting bags and sinking them into the ground will offer long term root protection.) Watering the shrubs or trees will also reduce root competition as they will be less likely to go ‘look’ for water elsewhere. Adult females keep their eggs under their waxy coverings for protection until they hatch, they over-winter on the plant in the same way. It usually takes about a month from birth to adulthood and there are usually 3 or 4 generations per annum. 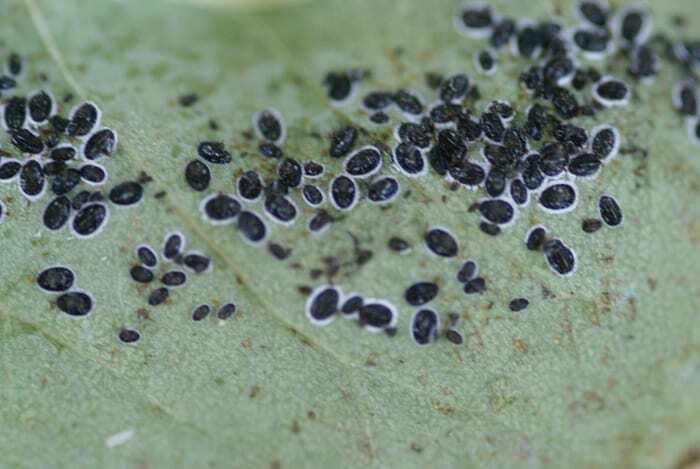 Eggs develop under the body of the female and emerge as young larvae. The mother produces young continuously for a 6 week period and up to 600 young may be produced. The female nymphs, which are wingless and termed ‘crawlers’, are not visible to the naked eye but resemble mites under a magnifying glass. Crawlers usually settle on a new feeding spot after half a day. Approximately 12 hours after feeding is initiated, they start to secrete wax, which will eventually become its protective scale. They lose their legs in the first molting. They remain sessile for rest of their lives. The immature males mature into mobile adults – develop wings and are dispersed mostly by wind. 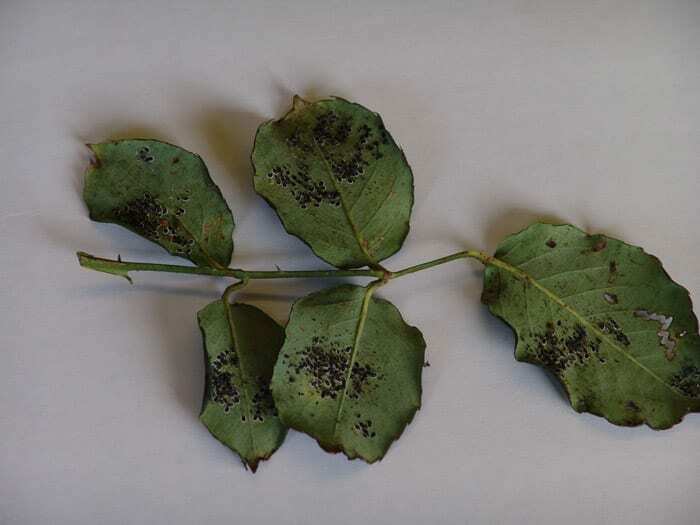 For a light infestation on a few roses – simply wipe the scales off with an old toothbrush. Cut away severely infected stems and throw away them away – do not discard on the compost heap.